Morakniv’s 120 wood carving knife is a great choice for beginners and delivers some of the best bang-for-your-buck you’ll find anywhere. Let’s take a closer look at this slick knife. There’s many features that make the Morakniv wood carving knife unique. One of the most important features about this knife is the blade. Mora chose to use carbon steel for the blade, giving it great edge hardness while being easy to re-sharpen. A clear laminate coating covers the carbon steel, preventing rust on all the metal except the exposed edge. The blade is 2.4-inches long, making it a good size for both roughing and detail carving work. Oiled birch wood is used for the handle, giving it a silky smooth and ergonomic feel. They did a good job of finishing on the handle, making it one of those things you don’t notice because it’s done right. This is the perfect knife for those who are looking to get serious about whittling. Whether you’re just getting started whittling or are a seasoned veteran looking for your next knife, this tool has something to offer everybody. The blade comes razor sharp out the box and is no joke. When you’re cutting through wood, this knife treats it like butter, just melting away slivers of wood nearly effortlessly. Choosing oiled birch wood for the handle is a great choice on Mora’s part. There’s nothing worse than having a rough, oddly shaped handle that strains your hands after only short periods of use. It’s very comfortable to use and is ambidextrous, making it a good one-size fits all solution for whittling knives. Being moderately sized at 1.3-inches around at the thickest point, it can also be used by people of any hand size. One thing I despise about this product has nothing to do with the actual knife itself. The sheath Morakniv ships with these whittling knives are terrible. I’m guessing Mora wanted to cut production costs by making a one-size fits all sheath instead of molding sheaths for each size knife. So, I can understand why they chose to include it, but it’s a disappointment when they could’ve knocked this one out of the park. The knife doesn’t fit right in the sheath at all. I mean, it fits, but not in the way it should. You’ll never really know if the knife is seated in there all the way. I saw one guy who cut himself on the first day because the knife fell out of the sheath and sliced a giant gouge in his pinky! Bottom line, LOVE the knife, HATE the sheath. You can decide for yourself, but I think it’s only good for storing the knife away for long periods of time. One of my favorite whittling pocket knives is Flexcut’s Whittlin Jack. It’s a lightweight and portable pair of whittling knives that easily fold away to fit in your pocket. If you’re looking for a folding whittling knife that you can easily carry for on-the-go whittling, check out the Flexcut Whittlin Jack. The Whittlin’ Jack has plenty to offer in terms of cutting power and versatility. With both a 2-inch roughing knife and a 1.5-inch detail knife, you’re set to take on most any whittling project. Carbon steel is used for the blades, giving them a razor-sharp edge that won’t dull halfway through your project. On the back of each blade is a square edge that you can push or pull against for more precise cuts. There isn’t any locking mechanism for the blades, but they do come stiff, being both hard to open and hard to close. For the handle, Flexcut chose to use a walnut inlay inside of the aluminum side plates and steel frame. Choosing these materials was a good move, as it keeps the knife very light at only 3 ounces overall, and only 4 inches in overall length when closed. You’ll find a deeply grained and rough feel to the wooden inlay, providing a somewhat grippy texture without being uncomfortable. There’s also a small finger cutout in the blade plus a rounded back to the knife, giving it a good ergonomic feel. is a great pocket whittling knife that can accompany you wherever you go. Weighing only 3 ounces and totaling 4 inches in overall length when closed, you’ll have no issues carrying it in your pocket. With the two blades you’re given, you can carve a near endless number of figures and projects. 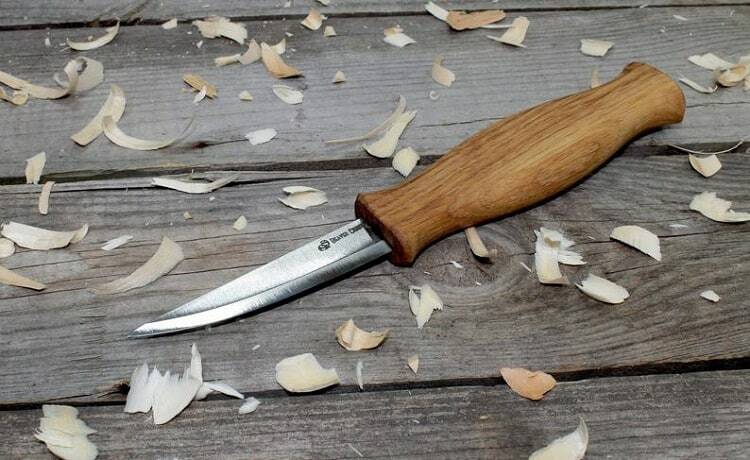 For strictly whittling, it’s quite a versatile knife. Having a roughing knife for quickly shaping out the silhouette and a detail knife for more intricate cuts and carving is a bonus. Instead of trying to mangle your project with a big bulky blade, you can use fine precision and get the exact cut you want. The blades sit very deep in the handle, making them somewhat difficult to pull out, especially since the folding mechanism comes quite stiff. Also, once you work to get a blade out, it doesn’t lock into place. While this isn’t the biggest issue since they come stiff anyways, it would’ve been a nice peace of mind thing to have the blades lock. Just be careful not to accidentally close your finger in, as these blades are sharp! Once you get the blade out however, you can effortlessly carve and whittle away at woods like basswood, hickory, oak, maple, or any other with relative ease. Flexcut promises razor-sharp blades and they deliver. With time eventually the blades will dull, and you’ll want a slip strop to hone them. Flexcut includes one with their Carvin Jack knife, but they chose not to ship one with this little folding knife. If you plan on using it more than a few times, I’d recommend you pick up one of Flexcut’s slips strops. It only takes about a minute of stropping and your blade has a new razor-sharp edge that carves through wood like butter once again. Overall, I think it’s an excellent pocket whittling knife. It’s lightweight, easy to carry, super sharp, and a great deal. Pick up a slip strop with this knife and you’ll have a great time whittling anywhere you go. 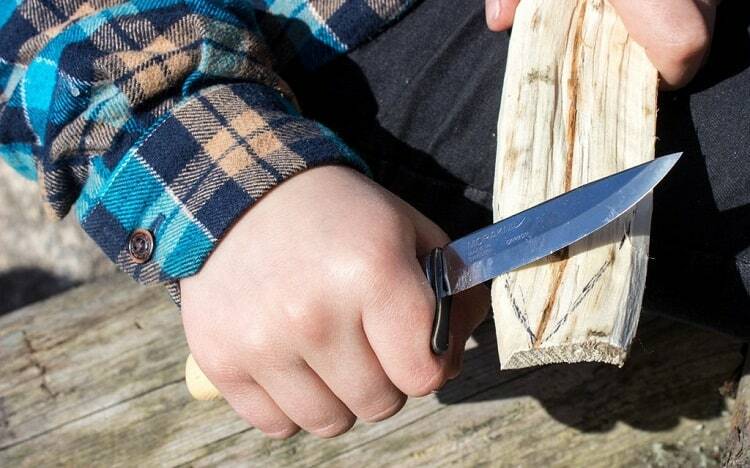 Teaching your child or grandchild to whittle is much easier with the Morakniv Wood Carving Junior. It’s a spinoff of the design I wrote about above, but with a few key features that really make it a great choice for teaching whittling. Give them a few templates and with some guidance about the basics they’ll go from whittling sticks and twigs to all kinds of soaps and wood like an old timer in no time with this knife! Morakniv modified their classic 120 wood carving knife and made a whittling knife that’s perfect for teaching kids to whittle. The feature that sets this knife apart from the pack is the finger guard. When you’re teaching younger kids to whittle, the last thing you’d want is for their hand to slip forward onto the blade, causing them to cut themselves. Having the finger guard prevents that and makes this knife much safer for children to use. Oiled Birchwood makes the handle smooth and easy on the hands. Not too large to be unwieldy and uncomfortable, and not too small to be difficult to control. Great size for any age child’s hands. 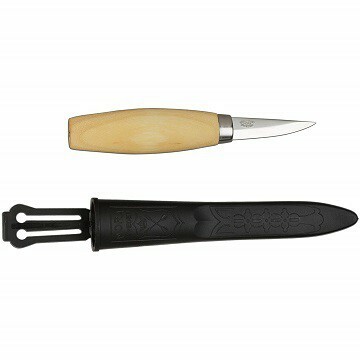 Morakniv includes a hard-plastic sheath like the one they package with their original carving knife. It’s the same situation as well, the knife doesn’t fit quite right, but it gets the job done for a free sheath. Let me start off by saying I love the finger guard. I think it’s a fantastic idea and a great feature that makes introducing children to whittling much less stressful. If you teach them to cut away from themselves until their ready for more advanced carving, they shouldn’t have any safety issues using this knife. If you know anything about knives, you’ll also know that a dull blade is a dangerous blade. Dull blades are more likely to get caught and slip uncontrollably, leading them to possibly cause harm, as a dull blade will still cut you. and glide through wood like butter. Very controllable and easy to perform long strokes. Much safer, effective, and comfortable than using an old dull Victorinox swiss army knife. This knife can perform both roughing and fine detail work, meaning they won’t outgrow this knife if they really work to develop their whittling skills. It’s well suited for teaching beginners without limiting them to how far they can push themselves to learn. The oiled Birchwood handle is smooth and perfectly sized for children of any age’s hands. They’ll have more fun carving away without hand strain and pain that you might find with oddly shaped pocket knife handles. Should be lots of fun! Now for the sheath. I think the sheath is more dangerous than the knife itself! If you read my review of the regular Morakniv carving knife, you’ll know that a guy cut himself when the sheath didn’t seat the knife properly and fell out on him. This is due to the design and mindset Mora hand when designing these hard-plastic sheaths. They’re supposed to be a one-size fits all solution that they can manufacture en masse for many models of their knives. While the knife does fit in the sheath and seats OK, it just doesn’t work as good as a properly sized and fitted sheath would. My recommendation when using it is to make sure the knife is secured in the sheath before picking it up and don’t hold it upside down or sideways so that it can’t fall out on you. One recommendation I’d give to you to keep the fun going with this knife would be to buy a slip strop and some polishing compound. These serve to keep the knife honed and razor-sharp, keeping it cutting smooth and preventing any hand strain or accidents from the blade being dull. Flexcut makes a good slip strop and gold polishing compound combo that should last you thousands of sharpenings. Overall, I love the Morakniv Wood Carving Junior. I think it’s the perfect knife for teaching children how to whittle. Give them plenty of supplies like wood blocks and a wood carving book or some project ideas from whittling blogs and they’ll be busy for a while. The finger guard is great for protecting kids’ fingers from slipping forward onto the blade without needing them to wear cumbersome gloves that may affect their fine cutting skills. Having a super-sharp blade is a bonus too, as it prevents the dangers and accidents that come along with a dull bladed knife. Using this knife won’t hold a child learning to whittle from reaching their true potential either. This knife can hold its own and allow them to learn and try as many different techniques as they care to learn! I’m not too happy about the sheath, but that’s more of an afterthought when the knife is the real meat and potatoes you’re buying. If you’re a more looking to add an extra level of detail to your whittling projects, check out the Flexcut Carvin’ Jack. It’s got everything you need to whittle and carve away at wood all in one tool. Plus, it also comes with a slip strop and gold polishing compound, giving you everything you need to use and maintain this knife for years to come. There’s a lot of features to cover with this knife. Just looking at the six tools, it’s easy to tell there’s a lot to this tool. There’s not much more you would ever need for nearly any whittling project. Each tool comes razor sharp out the box and ready to use. Plus, you can sharpen each tool on the included slip strop. Getting the tools out of the handle can be a bit difficult, they’re tightly packed in there. Once you get them unfolded, they lock securely into place and can only be released via a lever on the handle. Keeping the tools packed in tight is a necessity to keep this knife small and portable. When all the tools are closed, its overall length is only 4.25 inches. It’s also very lightweight for having six carving tools inside, weighing only 3.5 ounces. The wooden inlay for the handle comes with an OK finish, but it could be better. Not uncomfortable, but not silky smooth either. Speaking of comfort, the handle is founded on the back and has a rounded inside with space for your fingers to rest while you’re carving away. Flexcut includes a great leather sheath for you to store this knife in. The knife fits neatly inside, making it a great option for tossing in your car or storing the knife for long periods of time. Flexcut also includes a slip strop and gold polishing compound with this knife, making it a great all-in-one package that supplies you with everything needed to carve for years to come. Flexcut really outdid themselves when making the Carvin Jack. Having six different tools for whittling and carving in one pocket knife is a blessing. When I first saw the Carvin Jack, I was skeptical of how good of a tool it could really be. Could it stand up to whittling knife sets carving kits where each tool carving and whittling tool is separate? I was proven wrong. Each of the tools is carbon steel, coming razor sharp and ready-to-use straight out the box. You’ll have no issue working on more advanced wood carving projects with these tools carving into hardwood like butter. You’ll have a great variety of tools in the palm of your hand too. Any kind of roughing or whittling can be done with the precise detail knife. Carving, gouging, pinstriping and detailing is all taken care of with the set of carving tools that includes a straight gouge, chisel, v-scorp, gouge scorp and hook knife. Yes, that’s right, a hook knife too! 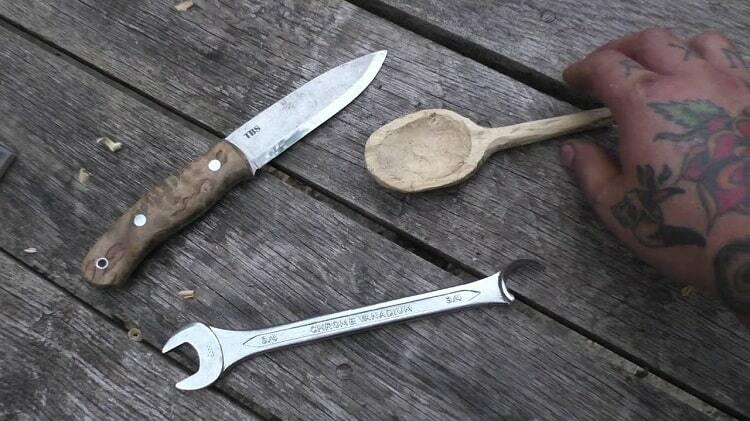 I know many whittlers who love carving spoons day-in and day-out, so there really is something here for everyone. 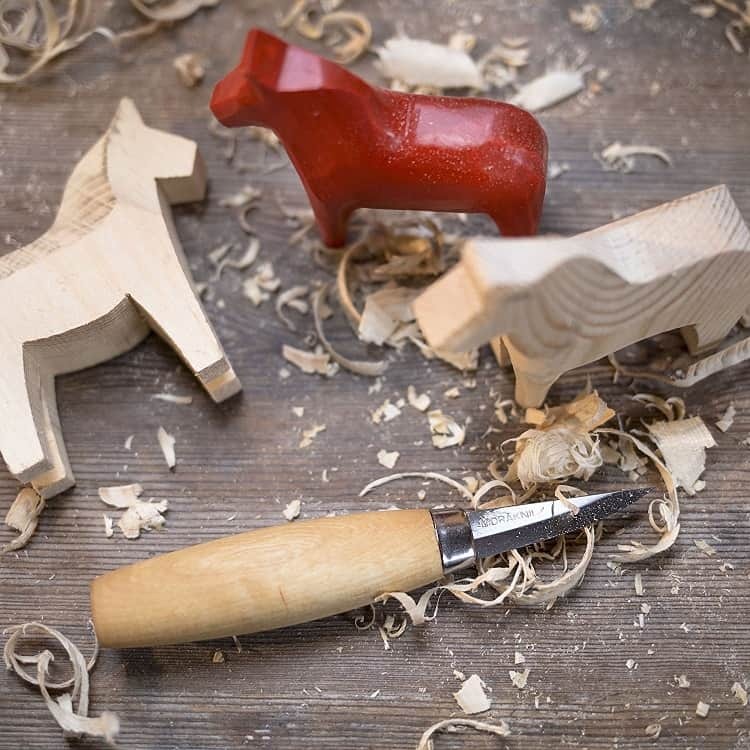 Depending on how much you know, you could also carve out bears, fish, chains, intricate animals, or anything else you can find tips, tutorials or instructions for! Each tool can be quite difficult to get out, as they’re jammed in there tightly. They’ll break in overtime with use though. Once you get a tool out, it securely locks in the open position until you release it with the locking lever on the backside of the handle. You won’t have to deal with any hand strain or pain using the Carvin Jack. The elegantly shaped handle has a rounded back and a rounded inside with finger reliefs for your fingers to rest in while carving. This knife has a good ergonomic feel and is clearly designed with the user’s comfort in mind. The leather sheath they ship with it is excellent quality and holds the knife very nicely. Great for both short term and long-term storage. Even more exciting than the sheath is the included slip strop. A slip strop is the final component needed to make this a complete whittling and carving knife package. It really brings the product together by including everything you’ll need to keep each tool razor sharp for hundreds of projects to come. Maybe in five years or so you’ll need to buy another stick of gold polishing compound, but otherwise, you’re set for life. Overall, I believe the Flexcut Carvin Jack is the best whittling and carving knife you’ll find anywhere. I really like how Flexcut makes this a complete all-in-one whittling and wood carving package that requires nothing else to keep you whittling for years and years to come. Flexcut did an outstanding job of offering tremendous value to their customers by packing a whittling knife and a carving knife set into one tool. You can use any old knife to whittle. Whittling knives are sharper, more precise, and more comfortable to use for extended periods of time. If you care about whittling and want to be the best whittler you can be, you need a good whittling knife. You simply can’t carve as intricate designs with a dull, cheap knife. Upgrading your whittling knife is one of the easiest and smartest ways to take your whittling skills to the next level. That’s why I’ve done the leg work for you and chosen the best whittling knives for a variety of hobbyist needs. From the flat out best whittling knives to the best budget whittling knives for the money-minded hobbyist, there’s something for everyone here. If you’re short on time, I made this helpful table as a quick-reference guide for most people’s needs. Before you choose a whittling knife, you first need to identify what you need in a whittling knife. Is it important that you can fit your knife in your pocket? Is a good bushcraft knife okay for whittling, or are there better options? Do you need a blade as sharp as a surgeon’s scalpel? Or possibly you just want the best quality knife that you can afford on a budget. I’ll touch on a few aspects you should consider when choosing a whittling knife. What Size Whittling Knife Should You Choose? Size is an important factor when choosing a whittling knife. I personally prefer a small bladed knife that is easy to get into small nooks and crannies for intricate carving. You may prefer a good medium-sized knife that can double as both an everyday carry knife and a wood carving knife. I know a few people who love whittling and just use a great compact and precise folding knife like the Ontario RAT-1. It’s up to you to determine your needs, but I wouldn’t recommend getting a knife with a blade larger than maybe 4.5-inches. Any larger and it starts becoming unwieldy and harder to make intricate cuts and carves. What Kind of Steel Should You Choose for Your Whittling Knife? Steel types are an important aspect that you should consider when choosing your whittling knife. There’s two main types of steel that you’ll need to decide between. Carbon steel and stainless steel. Carbon steel has the advantage of being easier to sharpen than stainless steel, while also holding a sharp edge longer than stainless steel can. If that’s the case, then why doesn’t everyone use carbon steel for all their knives? Rust. Carbon steel is prone to rusting easily. Stainless steel on the other hand, has great rust resistance. While the cheap stainless steels can’t compete with a good carbon steel, there’s plenty of alloy blends that allow the best of both worlds. For whittling, I recommend you choose a carbon steel knife. They’re easier to strop (sharpen) and hold their edges for longer. As long you take care of your tools and keep them clean, you shouldn’t encounter any issues with rust and corrosion. What Kind of Special Features Should Your Whittling Knife Have? One final idea I want you ponder over when choosing your whittling knife is any kind of special features you may want. If you don’t have any in mind, here’s a few examples that I’ve seen. One unique design I saw was that of the Morakniv Woodcarving Junior. It’s got a helpful finger guard that prevents your fingers from slipping forward onto the blade. Additionally, the handle is a bit smaller so that children can use this knife as a great introduction to learn how to whittle. The key takeaway from this knife is features that offer child safety and protection. Another great example useful features to consider is Flexcut’s Whittlin Jack and Carvin’ Jack. Both knives have more than the standard whittling blade. The Whittlin’ Jack has a set of two blades, one of which is a general roughing knife, and the second is a smaller detail knife. If you’re desiring a bit more precision from your knife for more intricate designs, it’s worth checking out. Flexcut’s Carvin’ Jack goes beyond just whittling and detailing knives by carving tools too. There’s multiple woodcarving tools from gouges, to scorps, making it a great all-in-one pocket whittling and wood carving knife.